Book exterior and interior spread with gatefold. Cover and interior spread with gatefold. My work centers on issues of power, exploring relations and dominations between people, between people and animals, and between people and their environment. Human interactions are necessarily filled with disorder and struggle; I observe and interpret the ways that people attempt to create order, with varying degrees of permanence, by manipulating and defining space within the built environment. I attempt to convey how these human geographies may then manifest at the most basic levels of psychology and embodiment. I often work within the medium of the book. I focus on the book as an object, thinking about transparency, accumulation and disintegration and how these impact the reading of a text or a set of images. I work out of a craft tradition, but I attempt to be conscious about the stages of craft and process, working with what is shown and what is hidden to discover, and then play with, the point at which the collection of parts become reified as a unitary object. Since book objects must be handled to be seen, I take into account the relationship of the visual surface to touch and bodily movement. I focus on materials and make many of the components by hand; fiber becomes paper, receives print, becomes book. My practice begins with research. At times, this has meant a close reading of a text, attuned to syntax and rhetoric. Of late, it begins with gathering information, reading within the body of knowledge surrounding the topic, and then closely observing physical places. I want to use this information to create visual imagery and objects that help us to think critically about our surroundings, make new connections between disparate disciplines, and encourage further inquiry. Channel and Flow documents an attempt to follow a stream on its path through a dense suburban neighborhood. 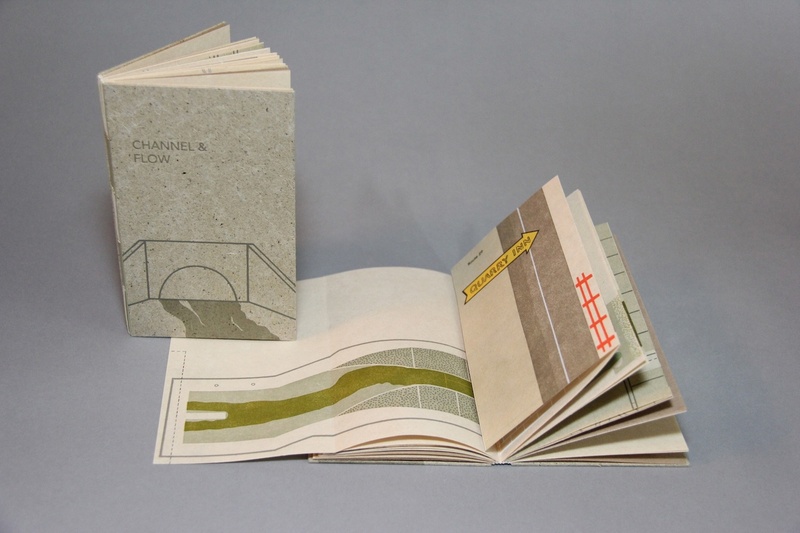 It uses the structure of the book’s page turns and foldouts to represent how the stream has been contained and fragmented by the built environment. Bound in a modified long-stitch format. Letterpress printed and screenprinted with hand-made paper covers.